How do Global Mobility Professionals demonstrate more Value? You can request a copy of the report by clicking here. While Senior Leadership recognizes the role that GM professionals play in the organization, does it transcend to having real benefits for those supporting the company’s best talents i.e. not feeling under-resourced or undervalued? Does your company do assignee pre-screening, where you determine the suitable candidates for international assignment? If not, this is something that you can explore and introduce. If done right, you avoid the pitfalls of selecting the wrong people. You are the expert, and you should try to demonstrate this frequently. You can do this through sharing GM insights, trends, and how these contribute to business/talent strategy. If the opportunity is available to increase your global mobility expertise through having certification and further studies. GM organizations and consultancy organizations provide certifications/courses, where you can further deepen your mobility knowledge. For example, Global People Transitions offers the FlyMe! Program, a career coaching geared towards Global Mobility Professionals. An academic course to certify you as a “Global Mobility Advisor” is available with Expatise Academy in collaboration with Erasmus University in Rotterdam, The Netherlands. Do you consistently communicate what you have achieved, projects you initiated? Ensure that you communicate the things that you do and how you have supported the business. In a study by Cartus in 2016, a global relocation services provider, it found out that 54% of companies lack focus on tracking and reporting on assignments. As such, this will be a focus for 2017. Hence, it is high time to gather that data (assignment success, costs, the return on investment, assignees feedback, etc.) and have a regular newsletter/blog or presentation at your next strategy/planning meeting. As my clients always ask, how will I know if the expat assignment is successful? A report should be in order to communicate such info. 4. Flexible, Agile and Able to Re-Focus. In previous years, the goal was to ensure that you arrange logistics and meet compliance needs, which are more transactional. In today’s world, the role expands and you are now viewed by the business as a strategic partner not merely as administrators. You should always understand what is important to the business. Today, the focus may be costs, but it might be something else in three months time. Keep your eyes and ears open for this and be agile and flexible. In addition, as practitioners (in-house or outsourced) you should also be aware of trends in terms of mobility practices and service delivery. You can start by looking at how technology affects the delivery. Do all assignees adapting to these changes, or do we provide omnichannel delivery? What do other companies do? Such questions might lead you to new service delivery models or enhancement. I hope these four points will prove to be beneficial for you and will help your team to push more value to the organization. So, don’t forget to get a seat, be the expert, market your value, and be agile & flexible. I remember a conversation with my previous boss, where he shared with me that HR is a cost-generating function, so it might sometimes receive smaller budgets (e.g. hiring additional headcount, higher bonus, etc.). However, HR’s role has transformed itself from a back-office support function into a more strategic business partner. This principle should also apply on Global Mobility regardless of where it is structured in the company (e.g. HR, Finance, Outsourced, etc.). In today’s world, Global Mobility Teams will be more valuable than ever! 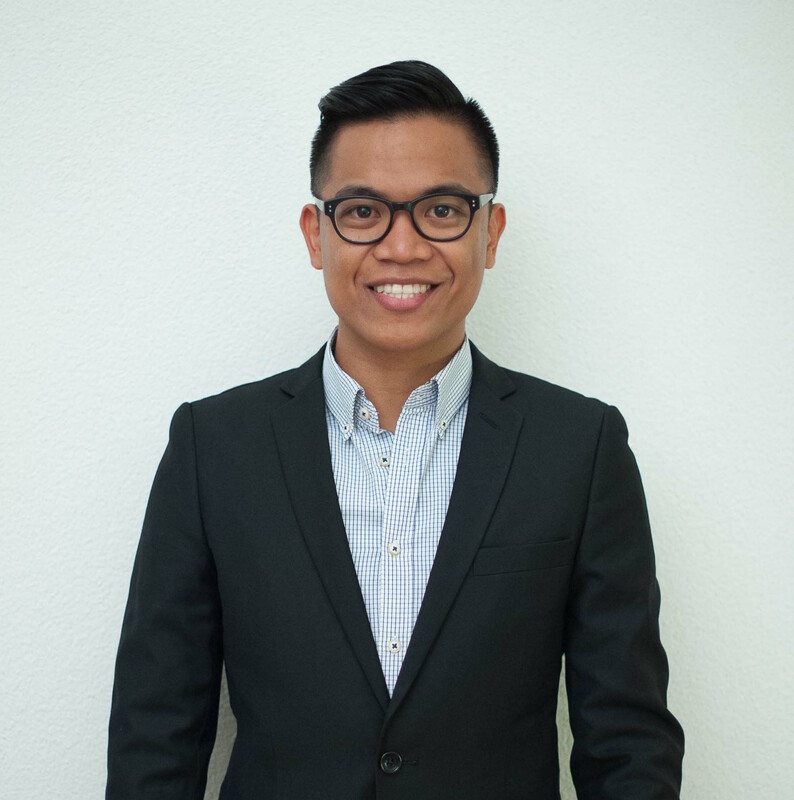 Kevin Castro is a Filipino by birth, who lived in Singapore for almost 8 years and is now residing in Zurich. A Global Mobility Professional, with experience in Mobility Operations, HR Services, Project & Supplier Management, and Customer Service. He is currently learning German and at the same time enjoying cooking & curating travel experiences. I feel that the era of treating people as numbers on a spreadsheet needs to change, don’t you? Steps in the right direction are already being taken and I believe that Global Mobility professionals and their increasing value in businesses is the example to rally behind. For the uninitiated, let’s talk today about how you as Human Resources or Global Mobility Professionals can demonstrate and amplify the value they bring to organizations. We had our guest blogger Kevin Castro tackle this very topic last year and it remains highly relevant today, so we are re-sharing the main ideas. First and foremost, Global Mobility professionals need to be agile. The goal posts are shifting all the time – organizations are reevaluating what is critical to business needs rapidly and adjusting the focus of their teams accordingly. Not only do you need to be aware of these changes as they happen, but you also need to be ready to adapt at a moment’s notice. Agility is the name of the game the most successful professionals in the industry right now are those on top of these trends. An important but often ignored part of demonstrating one’s value is the simplest: communication. Communication is key to a successful personal life but it’s equally important to the well-being of your professional one! It’s a well-known secret that many organizations slip up when it keeps to assignment tracking, so why not remind them, regularly? It’s for your good, after all. A presentation, an email, a newsletter, highlighting key successes and listing all that you’ve accomplished will go a long way in ensuring that senior leadership is aware of the value you bring the company. When was the last time you mentioned a successful expatriation of key talent to the C-Suite? When did you create a report that showed the company the cost-saving you achieved by creating a more effective compensation and operating model? Finally, it is critical for any GM professional to know how to flaunt their expertise. This sounds like common sense but in my experience, I’ve found it surprising just how many people express hesitation or reluctance when it comes to the subject of selling one’s skills. It’s important for all professionals, doubly so for GM professionals! You are the expert of your field, that’s why you were hired after all – you should demonstrate this expertise more often. Our domain is a rapidly evolving playing field of ever-shifting requirements, technologies, and expectations. This is in addition to the language, cultural and geographical integration requirements. You – are expected to have a multitude of knowledge, attitude, skills and you need to learn to constantly reflect your experiences and integrate body learning into your attributes. I tackled this topic in detail on last week’s “Club Sandwich”, you can catch up with the post here. One way to build your knowledge base is to join the Global Mobility courses at the Expatise Academy in Rotterdam, Holland. I’m currently teaching several courses, which are all now available to YOU, online. My courses deal with Global Mobility Competencies, while also focusing on intercultural competency, building solid international assignment business cases and most importantly, bringing the human touch back into our processes. There are all sorts of other technical courses available as well, by experts in the fields of immigration, taxation, social security, and employment law. Check out the new and shiny “Educate Yourself Platform” by Expatise Academy now. Please mention me when you sign up to qualify for a discount via this link or email learning@expatise.academy. Let’s keep our momentum going and aim to be even better at what we do. I believe in the “Future of Global Mobility” (#FoGM) and that we will grow in scope and influence. PS: If you mention anything relevant on social media, don’t forget to brand it with #GlobalMobility. As you probably understood already the arena of Global Mobility is vast and no Global Mobility Manager will have all the answers. If you enjoy constant challenges and a day that never looks the same Global Mobility could be right for you. However, you also need to be very structured, focussed and analytical. For Global Mobility Educators, it is a constant challenge to provide a curriculum that is based on the right career level and also deep enough. Most courses you will find about Global Mobility in your home country will assume the home approach and all the special legal areas will mainly be presented based on “home” legislation and in the home language. If you are managing a global population and wish to implement a host approach you will need to go through a lot of learning by doing and you probably have to invent the wheel. I recommend the Expatise Academy program in Global Mobility because I am a lecturer at the Academy and have seen how they ensure the high-quality standards in teaching. The program has a modular approach and follows your career development as a Global Mobility Professional. You should consider learning the basics at least for the home country of labor and employment law, immigration, personal and corporate tax and you need to understand your Global Mobility policy and compensation approaches. A factor that is often underestimated in Global Mobility is the critical importance of developing global competency. As long as we do not see cultural diﬀerences, we do not know why men and women from other cultures behave and think diﬀerently than we do. We just assume that they are “strange”. Also, we might think we treat the other person with respect but the concept of respect is deﬁned diﬀerently in other culture. Even if we consider ourselves open-minded, we might not have developed the skills that we need in order to be more eﬀective in other cultures. Our brains today still work in a similar way to that of the cavewoman. We often decide only about ﬁght or ﬂight. We hardly ever step back in stressful situations and think “Why is that person behaving like this?”. We rarely sit down, take a deep breath, smile and then write a polite email to say that our judgment of the situation might have been guided by our own values and assumptions. No. Normally we jump to conclusions ﬁrst and put other people’s behavior in a box (Like / Not Like). Facebook does not help. We rely on our mental images and can become prejudiced because this is the way our gut decides if we are safe or in danger. Our mental images are inﬂuenced by our inner landscapes but also largely by the pictures we see on the news channels every day. When some Westerners hear “Pakistan” they think “terrorism”, “Islamists”, “oppression of women” and “Osama bin Laden” instead of “IT professionals”, “tourism” or even “Benazir Bhutto”. 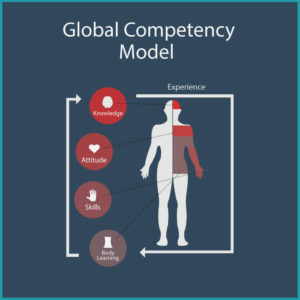 For the development of global competency, I have developed a simpliﬁed model with ﬁve elements: knowledge, attitude, skills, experience and body learning. I ﬁrst explained this model in an article in the German-speaking HR magazine Persorama (Weinberger, 2013). I work with this model in executive coaching and it also helps junior professionals start developing their eﬀectiveness in a global context. Global Competency is the ability to work eﬀectively in a global, complex environment with a high level of stress while achieving goals sustainably and in accordance with your own resources. It is a combination of knowledge, attitude, skills, reﬂected experiences and body learning. Let’s look at the different elements of Global Competency. You can gain knowledge of a country’s history, politics, economy, and religion. It is helpful not to focus only on factual information but to prioritize all the topics you enjoy reading about. As mentioned previously, start with the home country and move on to the knowledge areas of other legislation. Areas of knowledge you need to study are the tax, social security, immigration, local employment law, business terms, compensation and beneﬁts, country-speciﬁc history and processes. It is very important that you develop openness for ambiguity, the potential to accept new experiences and the questioning of your own cultural minting. Through making yourself aware of and verifying your own cultural beliefs, you develop a more open attitude. Once you understand and are aware of your own cultural attitude and behaviors you are able to change your behavior to be more eﬀective. You want to develop a global mindset and become more open towards ambiguity and not knowing. You want to practice curiosity and learn to be humble and serving. Through developing your foreign language skills, active listening and empathy you can gain better access to people of other cultures. In today’s technology-driven times I believe it is also important for a globally active professional to have media competency. It’s important to be eﬀective in telephone and video-conferences, but also to be able to build connections via LinkedIn, Facebook and Twitter. If you are working in Global Mobility you will have to develop your analytical problem- solving skills, you need a feel for numbers. You want to develop your language skills (especially English). You might need consulting and communication skills. You need to improve the way you build relationships. You need to work with information and communication technology eﬀectively and have a grasp of Social Media. When dealing with other cultures it is helpful to analyze critical situations and incidents. One option is the „search for the proof of the opposite. You could, for example, have an assumption about a person’s cultural behavior and then assume that it’s the opposite of your assumption and ﬁnd proof for this theory. You can start to write an intercultural diary and reﬂect your assignee cases by applying systemic thinking. You need the ability to record cases, decisions, and exceptions. You need to able to note the details while not losing focus of the overall process. You could debrief challenging assignees with an external coach. By learning dances or practicing martial arts, and relaxation methods you learn to focus and you will feel better in your body. Thereby you will be able to handle the stress and global complexity a lot better. A good physical constitution is helpful to remain globally competent and effective. Other creative tasks such as painting, playing the piano and photography are also helpful. You want to develop a good routine for processing information. You can increase your presence in meetings and with your clients by following our advice on learning a dance, martial art or relaxation method. A lot of scientiﬁc work has been written on intercultural sensitivity. My favorite model is Milton Bennett’s developmental model of intercultural sensitivity (DMIS). This model is the basis for the Intercultural Development Inventory (IDI) by Hammer and Bennett (2001). Would you like to test your intercultural sensitivity with the IDI and see if you estimated your competence correctly? If you would like to go through the test you can email me. The cost is CHF 97 including a debriefing. Over the last twenty years in Human Resources, I noticed that a lot of international talents were frustrated in the process of moving to another country for work. It was not only because their companies paid them another package than what they expected. It was also because a lot of international assignees underestimated the challenge of moving to another country. 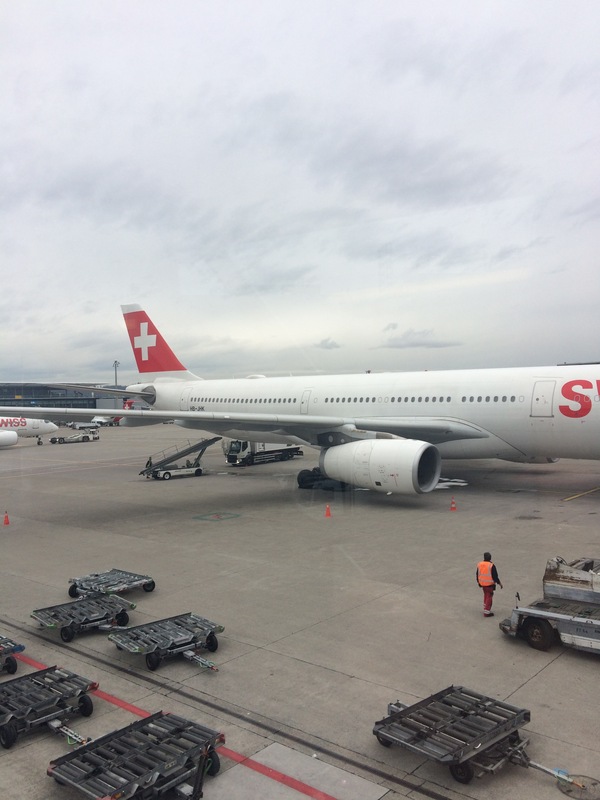 For example, expats moving to Switzerland often think it will be easier to find affordable childcare, high-quality apartments and a job for their “trailing” spouse. Most expats believe it will be easy to learn the local language (or they even think we speak English). Most expats believe that they are going to have a great career step after their repatriation. I have seen a lot of anger when assignees went to another country and when they returned home and did not get that promotion or the role they were hoping for. Regularly, I have clients break out in tears because they feel overwhelmed by the international assignment experience. When I worked in India and when I moved to Switzerland from Germany it was not always just “Cricket & Bollywood” or “Cheese & Chocolate”. There are five gaps in the Global Mobility approach and I think this is true across industries and countries. Assignees are often selected on an ad-hoc basis and intercultural competence is hardly ever taken into account in the selection process. Female Assignees are still greatly under-represented. International assignments hardly ever have an international assignment business case showing assignment drivers, measurable targets, expected gains, growth opportunities, assignment costs and a repatriation plan for the assignee. Most companies lack succession plans where repatriates could be included with their future roles and often expats are overlooked when it comes to filling roles in headquarter or when promotions are due. Global Mobility Professionals are hardly ever considered strategic partners of the business. They are often just seen as administrators of the process while the decisions about who is going where are taken solely by the business. The Expat Family is hardly considered in the Global Mobility Approach. Only a few forward-thinking MNCs offer career support for spouses. I have not seen any company who helps with educational considerations and advice for the expat children. Relocation companies only give minimal support and hardly understand the concerns of globally mobile parents. Most relocation consultants have never moved to another country in their lives. There are also five global trends that have made Global Mobility more difficult in the last 10 years. With the global financial crisis, we have also experienced travel and expat budgets being reduced to a minimum. That led to a number of local moves and assignee experiences, in general, got worse. Also, repatriates often came back to receive a severance package and were unemployment in their home country afterward. We also see that companies merge, acquire, outsource and offshore so that job security for all staff is non-existent. Especially in the EU, many countries are new to this kind of unstable job market and do not yet have the tools and systems in place to have a fluid and flexible workforce. Cherished and spoilt expats dwell on the verge of desperation because they have been made redundant at the end of their contract. Other expats receive a local contract without really understanding what that means for their social security, long-term pension and often they do not know that their work and residence permit depends on their employer too. Employers find “Local Plus” convenient but they do not really consider all the risks these moves entail because many business decisions in the last ten years are driven by controllers. We now lack the critically needed talent in important growth areas. Programmers and engineers are examples of professionals that are in high demand. In Germany, I heard that it is also hard to find lower qualified staff such as hotel staff. There is certainly a mismatch and gap between demand and supply. There are a number of reasons related to the sourcing process as well. Recruiting has become a science and needs to go through a transformation. Recruiters need to learn to cope with the demand and supply in a globalized market of talents. Language is still one of the main barriers to an influx of highly skilled migrants in Europe. Even though we launched the green card and blue card initiative we have not managed to attract the potential and talent needed within the EU for example in IT. Security concerns are growing in international assignments. Expats frequently face acts of terrorism, natural disasters, mugging and burglary as well as health issues. While often the issues are normal in the local environment they can also be inflated disproportionately in our media. The images we have of countries such as Pakistan, Iraq, and Afghanistan to name a few make it hard to convince families to work in these countries. Each terrorist act in the last few weeks in Istanbul, Jakarta, Tunis, Paris or Beirut will reduce the willingness of expat families to move into these cities even though expats probably have the best security support you can have in these locations. 2015 has been a year where global migration became pop culture. The term “refugee crisis” was coined in Europe. Even though we have had proportionately more refugees coming to Europe since the Arab spring started in 2011 in Tunisia, we all had more interaction with refugees in 2015. While I am personally concerned about the right-wing propaganda, I do understand that the intercultural and societal challenges of integrating refugees at least temporarily are considerable. As an HR Manager, I am concerned about discriminatory practices. Example: Geneva airport security personnel. All of this has a led to Global Mobility being flawed, expats not wanting to go on international assignments anymore and overwhelmed GM Professionals who feel the pressure from all ends as they are in the firing line of assignees, business line, talent, HR and Finance managers. In addition to having been undervalued, overworked and squeezed by their interest groups classical GM tasks have been outsourced to Third-Party Service Providers and Shared Service Centers. Working in Global Mobility used to be a career dead-end and a Sisyphus task. We roll up the stone assignee by assignee only to see it roll down again. We run KPI report after KPI report only to be told that no one knows what we are doing. We are often managed by HR Directors who don’t get us. We are online 24/7, involved in GM improvement projects, listen to depressed spouses in our evenings and do not get the promotion or salary we deserve. But there is hope. I am not willing to give up. Yet. There is a need to change the approach to Global Mobility. The more complex our global markets become, the more we need to re-evaluate our assumptions of how we run international assignments. 1 We need global leadership competency in our international assignees and if they do not have it yet we need to send them out on long-term assignments earlier in their career. We should force assignees to learn the local language and coach them through the assignment experience. Intercultural briefings are not enough anymore. 2 We need to ensure that there is an international assignment business case showing assignment drivers and targets, expected gains or opportunities, assignment costs, and a repatriation plan. 3 We need to implement succession plans and add our current assignees as potential successors. We need to ensure that the knowledge, skills, and network they gain while on assignment is appropriately reflected in their following role and repatriation plan. We also need to ensure better handovers to their successors in the host location. 4 We need to upgrade the GM Professionals and the GM function needs to sit closer to business development and potentially move out of HR. We need to up-skill the case managers and train GM Professionals for a consultative approach where they can work as trusted partners with the business line managers. (I have extensively explained this topic in an article last year for The International HR Advisor). 5 We need to consider the Expat Family in the process more by providing spouse career support, elderly care and educational advisory. We also should offer 24/7 support to our expat families in crisis situations such as marital issues. A helpline to professional counsellors is needed. I believe that Western managers of my generation and the baby boomer generation have to develop their relationship-building skills before becoming effective leaders of global teams. The performance of most global teams can only improve through higher global leadership competency following a holistic global competency model. I believe that a great assignment experience is linked to assignment targets, an international assignment business case and a repatriation plan. I believe that companies will focus more on creating succession plans and ensure that roles are filled in a more structured manner, handovers improved and teams will function more self-managed going forward. Leadership itself will change significantly. I believe that GM Professionals have the potential to become critical players in the international growth of businesses and should be valued as the subject matter experts that they are. They will move out of HR and be closer to business development. I believe that assignees and spouses need to have a valuable intercultural experience and both can further their career and life vision together. Expat children need support in moving from one culture to another and even though they might be multi-lingual at the end of their school life, they have to cope with identity loss and loss of their roots. How can we support you in your development, Global Mobility Professionals? More than a year ago, I held a talk at the Forum for Expatriate Management event in Rotterdam. Every word is true in 2017. I am nowadays more involved in operational global mobility topics than I ever was and while the constant filling of payroll instructions, hypo tax calculations, and balance sheet updates reminds me of the Sysiphus tasks I mentioned in the talk, I have learned a great deal over the last few weeks. I am contemplating that even expatriate payroll is so much more interesting than normal payroll and that we need professionals with intercultural competence to ensure that the expats get paid correctly. You would think this is easy but believe me in 2017 with all the technology, processes sometimes seem more complicated than in 1999. At that time we used to calculate net payments on paper. In the last few weeks, I used a calculator every day and excel became my second best friend. On a few occasions, we don’t seem to get it right in the first attempt. The bonus is wrong, the expat unhappy and we get a new calculation. Then we start again. The third time it’s easier. In a case from the UK, I notice that the pension contribution has changed from the previous year. In one from Madagascar, a figure was not transferred automatically into the next record of the assignee. A lot of checking and cross-checking is needed. Once you think that you finally have created the right balance sheet you send it to the assignee and they tell you that it is a joke. They challenge your figures and you need to go back to the provider and explain why the tax system in the UK reduces your personal allowance once your salary reaches 100k GBP so that your bonus is taxed at an unimaginable tax rate. Or why the INR has devalued against the EUR and how that is reflected in the Cost of Living Adjustment. Then they ask why the COLA is calculated on spendable income only and how we came up with that figure. We solve issues with manual workarounds that we cannot seem to handle with technology. We need good working relationships with our colleagues and the expats around the world to solve those dilemmas. We need superior technical skills in tax, social security and immigration and other subject matter areas so we don’t lose oversight of the full process. Without the experience of at least 200 cases, it is really hard to see patterns in your problem-solving approach as every case poses a different country combination and needs to be tackled individually. We need high levels of focus and productivity to deliver excellent solutions. We work too many hours and it is hard for us to keep healthy. Many of us are women and at a career and pay level that is way below our background, competence, and qualification. One of the reasons why I started my company Global People Transitions was to help Global Mobility Professionals develop further. I would like to encourage you and support you with advice on how to get your develop your global competency further. You can check out the Global Mobility Workbook for further explanation, apply to become a tester of our Global Career App and you can book coaching sessions with me under the FlyMe! Program. You can also find Global Mobility job offers here and if you follow me on LinkedIn. Let me know if you see yourself in the issues I mentioned and what you will do as a next step to move forward.